Obama in Costa Rica: What do the Costa Ricans think? Sit down and chew on some of BITLU's Grade A anecdotal data. Spit cup in the comment sections. I'm an American who in September 2010 moved to Costa Rica for a job. As some of you may have heard, Obama is here/will be here in a few hours (flying in from México). For the past couple of days, Blackhawks have been hovering over the Costa Rican capital, San José, and shining their bright lights on every knook and cranny of the Sábana area (the second largest, and the most popular park, and its surrounding neighborhood). Secret Service have been spotted bustling/combat rolling/jazz-ercising [I don't know what they do in prep for the Prez visit] around the Inter-Continental - one of the most fancy-pants business hotels in one of the most Americanized boroughs of San José, Escazú. Across the street there is an Outback, a Hooter's, while next door you can dine at Chili's, to say nothing of the fast food kings littered throughout San José. I wonder what the Costa Ricans make of this show-of-force security, especially given the fact Costa Rica has no army and considers itself a pacifist nation? I don't even know what to make of this security excess. Obama isn't even making a public appearance! I wish he was. I would love to see Obama speak live. I never have. I lamented as much to a Costa Rican colleague. His response caught me by surprise. I like Obama, but I am ok with not seeing him. Can you imagine what would happen if one crazy person hell-bent on hurting him had even a shadow of success? I don't want to risk it. Let them do everything they need to do to keep him safe. Imagine what would happen to Costa Rica? [shudder] I'd pack up my family and go. Anyone who can afford to do so, would as well. Would you stay if something happened to an American president in Costa Rica? The sooner he leaves, the sooner I can rest easy. I shopped that opinion around to other Costa Ricans and expats. Everyone agreed emphatically. The strongest reaction to Obama's visit is one of fear. Not fear of Obama, the man, but fear of America, the ruthless, militant nation which villainizes foreign nations rather than crazed lone wolf individuals. I emphasized the phrase 'American president,' because it highlights the nuance that this fear is not linked to the Obama Administration specifically, but to American's over-broad ruthlessness. One Costa Rican astutely pointed out that America would not stop at acosting the individual perpetrator(s), but launch a full force investigaton to (and here he hilariously imitated American talking heads in an ominous voice) "root out the growing threat of foreign-born terror in Costa Rica." What kind of retaliation do they fear? That ranges from military (few believed it would be war/violent, but believe it would manifest in increased surveillance, arrests, and interrogations) to economic and political sanctions. I agree I would flee Costa Rica should an American president ever fall to harm here, because the economy would shudder to a halt. American tourism will effectively stop, American corporations will feel pressure to pull out (especially the tech companies, of which there are many, fast food would likely stay), foreign direct investment from around the globe will panic out of Costa Rica, and economic sanctions will hurt Costa Rican exports. The image I used depicts Costa Ricans who criticize Costa Rica for catering too much to the American economy and American tourists. The influx of dollars strengthens the Costa Rican currency, which makes Costa Rican exports less competitive, and raises local prices which lowers the real wages of Costa Rica's poor. 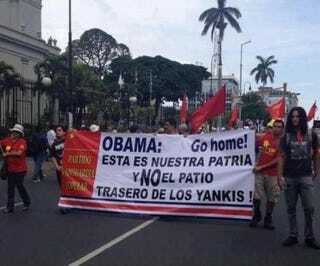 The banner reads, "Obama: GO HOME! This is our nation, and not the Yankees' backyard!"